Renz is currently pursuing NSCA Certified Strength and Conditioning Certification. Renz has experience in collegiate strength and conditioning as an intern and gained knowledge in athlete sport development. Renz is interested in continuing education in healthcare, rehabilitation, and overall health and nutrition. 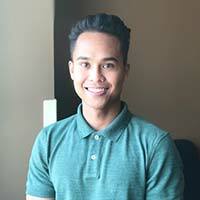 Renz enjoys helping patients with their exercise rehab process in the clinic. Renz enjoys spending time outdoors going hiking, fishing, and snowboarding. Renz also enjoys coaching, working out, and playing sports. Renz is hoping to get a Master's Degree in the near future to further his education.